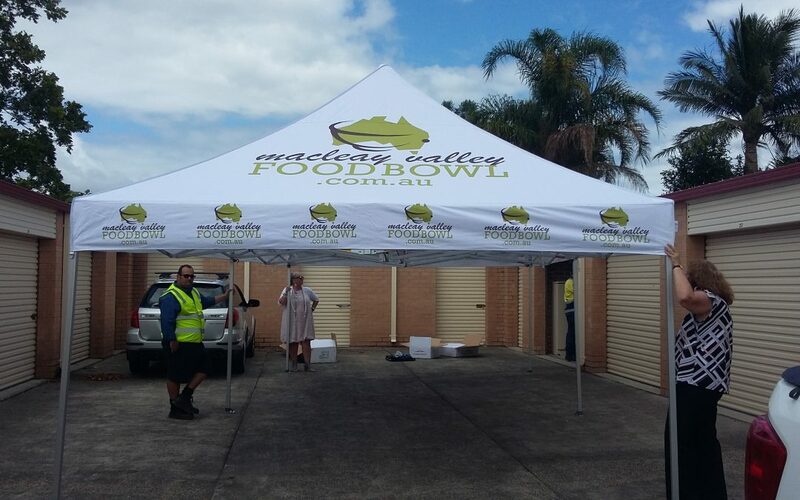 Macleay Valley Food Bowl producers now have a brand new marquee for markets and other events. A dedicated group of loca producers will man the marquee thus ensuring Macleay Valley Food Bowl products are sold and promoted locally. The marquee will ba a regular at the Kempsey Riverside Markets, Gladstone Quality Market and other events in the Macleay and surrounding regions. The Macleay Valley Food Bowl logo is gaining recognition in the region and surrounding areas. The use of the logo on the roof top of the marquee ensures ongoing recognition of the intitiative. The branded marquee raises awareness of the presence of our local producers at events. We look forward to increased intereaction with locals and visitors. The marquee is a fabulous way to showcase our diverse local produce and products. Local producers will be manning the stall in relevant seasons as their product comes to market. The marquee will make its debut at the Kempsey Riverside Markets on Saturday March 3 2018. Customers looking for fresh local food will find us out and about from March. Be sure to keep an eye out for the Macleay Valley Food Bowl logo!